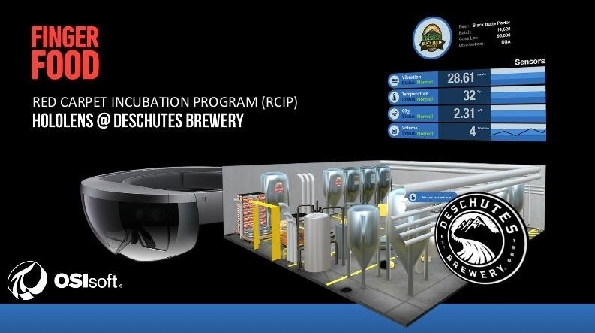 WASHINGTON, D.C. – The Microsoft HoloLens isn’t actually brewing beer, but for Deschutes Brewery of Bend, Ore., it helps them reduce waste and improve the quality of its craft beers. Founded in 1988 as a brew pub, Deschutes has grown into one of the larger micro-breweries in the U.S. with products such as Black Butte Porter and Mirror Pond Pale Ale. But the company’s fermentation process was pretty much a guessing game for the brew-masters of the company. This led to a lot of waste and could at times compromise the quality of their products. The company took a trip to Port Coquitlam, B.C. to visit solution provider FingerFood Studio’s 25,000 sq. ft. Holodeck facility to see a proof-of-concept of the HoloLens solution that shows all 50 vats, plus piping and control systems. FingerFood was able to visualize the Deschutes facility from an actual scale and a micro-scale viewpoint. “We did a mixed reality view for Deschutes with an augmented reality overlap that shows someone the experience of walking around the brewery,” said Mark Gerberman, AR/VR strategic partnerships and business development for FingerFood. With the HoloLens, the supervisor of the facility can go on vacation and leave animated sticky notes or videos throughout the facility for the back-up supervisor to check on, he added. FingerFood has also integrated Skype into the solution so that Deschutes can bring in a subject matter expert from a remote location. “Deschutes needed a visual layer for their digital transformation. The beer business is a low margin business. The process costs a lot of money so every drop is important to them,” Gerberman said. Fermentation process now has three Internet of Things sensors collecting data from three-sensors on each vat that informs the workers before the fermentation begins. The plant manager can also predict problems before they actually happen and do preventative maintenance. The whole facility sports between 200 to 400 IoT sensors. From there the brewery uses the PI System from San Leandro, Calif.-based ISV OSIsoft. The PI System is an open data infrastructure for integrating, contextualizing, and visualizing time series data. “Every time the temperature is measured, the levels of the vat are measured and the gravity is measured it is tracked in PI, said Matt Geerling, a systems engineer from OSIsoft. Before PI and the HoloLens, Deschutes’ steps to brewing did not have a clear view of when to stop the fermentation process. The brewery operated it manually measuring the vessel ever eight to 10 hours and then guess when to stop. The PI System is on the Azure cloud and the brewery was able to use a data scientist to develop a new fermentation process for its stout, ales and IPAs. Geerling said that Deschutes saved approximately 72 hours of lost production and it enabled them to produce better beer consistently.